Perhaps there’ll be a time when we reminisce fondly about streaming errors, or Netflix’s lacklustre movie catalogue. It’s tough to imagine now, but nostalgia has a way of rendering past annoyances quaint, and of lending new charm to once-perfunctory sights and sounds. Related: the best PC indie games. 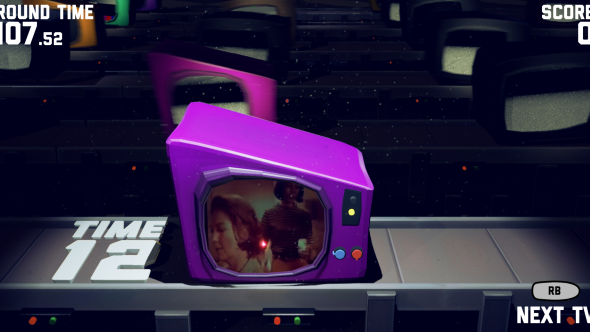 In TV Trouble, a game that has you working as a TV repair person in 1967, it’s the plastic clunk of analogue buttons and the gentle wash of white noise. As faulty machines lurch down the conveyer belt before you, you’ll prod away at each in an attempt to produce an image on the screen. Some have antennae to bend and multiple knobs to twist. Others have a seemingly arbitrary number of channel buttons to flick through. If you’ve done something right, you’ll be rewarded with the sudden blare of the strings in a Western score, or a clear view of an advertisement for tyres. Then it’s onto the next one. “There’s something about the way video artifacting looked and sounded in the analogue era that had a weird sense of character to it that is no longer a thing that exists,” notes Wilson. Wilson made TV Trouble with Kathy Zalecka, Dan Cohen and Al Taylor, friends from university who have since developed a “working rhythm” through 48 hour game jams. This particular project came together over a weekend on chat client Slack last February. 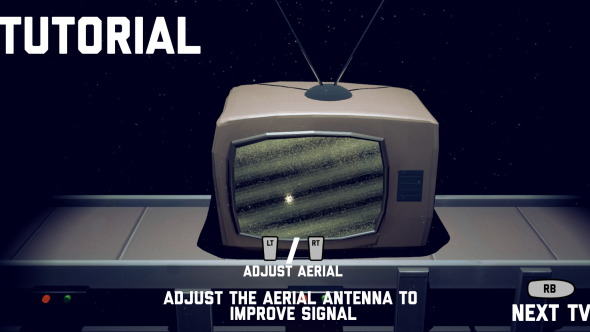 After an evening spent throwing about “goofy ideas”, Wilson’s partner chimed in with the suggestion of a game about TV repair. Wilson was drawn to it, taking his cues from WarioWare. 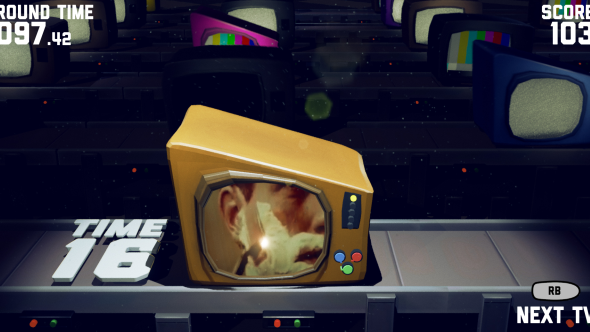 TV Trouble, it was decided, would be a time attack game – a hectic conveyer at odds with the wistful period imagery. Wilson pictured the player as a nameless worker in a huge, uncaring company, overworked and disgruntled. You’re given an intricate task that requires concentration – turning the dials is somewhat reminiscent of the tumbler minigames in Thief or Fallout – but not nearly enough time to perform it comfortably. 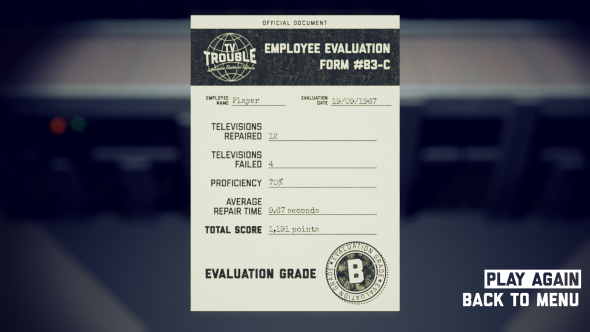 For a little while the team contemplated giving the player limited lives for failing individual repairs – but caring so much about each TV didn’t match the premise of a worker paid too little to worry about the machines that slip through the net. “Letting players freely give up on a TV they were stuck on without having it lose them the game felt more appropriate,” says Wilson. “I like that the game is sort of indifferent about whether or not the player is doing well. The team worked in Unreal Engine 4. Its visual scripting system for non-programmers, Blueprint, is “pretty much the single reason” Wilson has been able to spend the last few years making games like TV Trouble and Button Frenzy. For TV Trouble, he built a system that dynamically shifts the pitch of a machine’s audio as you’re tuning it in. The images themselves came from a free archive site, where Wilson had previously dug through footage of ‘60s television. He had become interested in the sometimes blunt adverts, a world away from today’s, and the way the “appallingly offensive” was presented as the norm. “There’s so much material up there that you can kind of steep yourself in it and just imagine what it might have been like to live in that time period,” he says. Zalecka whipped up 3D models and art to match, and TV Trouble became perhaps the first ever period piece time attack game. The four friends showed TV Trouble at last year’s EGX in the Leftfield Collection, and it’s now been released for free on Steam. 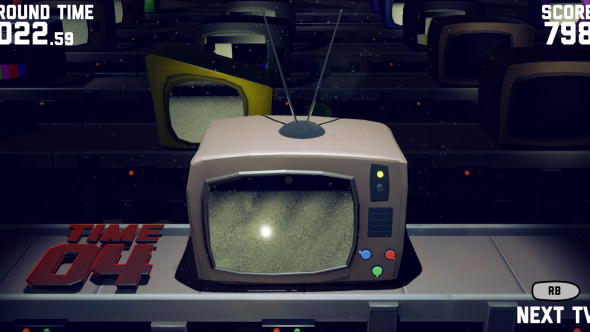 TV Trouble is available for download on Steam. Unreal Engine 4 is now free. In this sponsored series, we’re looking at how game developers are taking advantage of Unreal Engine 4 to create a new generation of PC games. With thanks to Epic Games and SUPERCORE Games.